Well, once again the summer vacation is over and kids are back in school. It also means it's time for me to get back to my usual routine, one of which is to hit the gym regularly again. In light of this, let's talk about healthy snacks that will give you the extra energy to crush your workouts. I have quite a few favorites as most of you will know from my previous posts; but, my current favorite is this Spicy And Chocolaty Energy Balls. The spiciness comes from the cayenne pepper, which is good for you. I was a bit heavy-handed with the cayenne pepper when I first made them, turned out spicy but still good nevertheless. Since then, I have toned down the spiciness level a little to suit my taste buds. So, do adjust the spiciness according to your taste and liking as well. 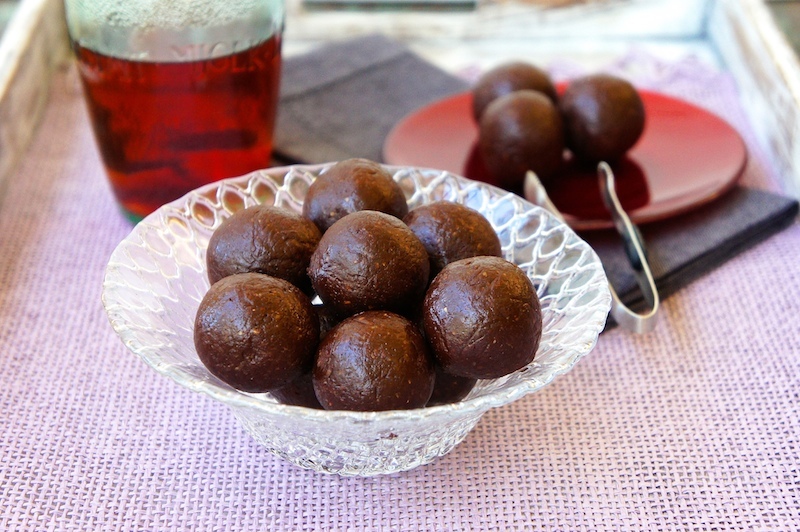 These energy balls taste like brownies and they are superb! Combine chopped dates, oat bran, almond meal, sea salt, cinnamon, cayenne pepper, and cacao in a food processor. Pulse and process all the ingredients together until the texture is coarse. Then add the almond milk (1 Tbsp at a time), a quick pulse, or until it reaches a dry but moist dough consistency. Scrape the dough mixture into a clean bowl; roll a heaped tsp of the mixture between your palms into compact little balls. Put them on the tray and into the fridge for an hour or so to firm up. Serve chilled or at room temperature. Hi Angie, I have never eaten this before but sure looks good. Thanks for the gifts once again and I love that Piggy Spatula :p and hope to meet up with you the next time you are back in KL :) Take care and have a great day! You are most welcomed! Yes, let's try to meet up next time. You probably have to increase the amount of almond meals if using condensed milk. However, give it a try, and have fun. They look great! I love how dates and chocolate can make such a brownie-like concoction. Love the idea of adding the cayenne too!